Moritz Sanders (here playing for Brose Bamberg) hopes to take the next step with Nurnberg Falcons. Taking The Charge Podcast Episode 216: The Chicago Cubs are just hours from Game 7 of the World Series and Dave is in the Chicagoland area, so that means this will be a short podcast. 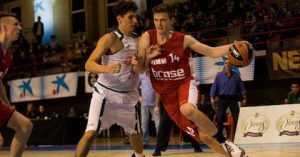 We talk a little bit about the NBA, EuroLeague and Basketball Champions League before we jump into into the interview with German 1998 born talent Moritz Sanders. Episode 216: With Dave being in Chicago to experience the World Series, basketball talk will be limited this week. But we still chat a bit about the NBA, EuroLeague and Basketball Champions League.